How many radiologists should a hospital have onsite? Health care facilities are increasingly debating whether to expand their use of teleradiology services—and to what degree. The reasons are many, with declining numbers of radiologists, increasing image volumes, and improved teleradiology capabilities leading the way. The shift to value-based care is another imminent challenge. "Medicine and specifically radiology are under siege. The two primary attacking forces are declining reimbursements and increasing regulations," says Greg Rose, MD, PhD, CMO of Strategic Radiology. "As radiology leaders, we must clearly understand these issues and then find ways to address them." To understand and address these issues, Rose convened an RSNA roundtable, "Inventive Radiology Staffing," at RSNA 2016. Since 2012, Rose has been running roundtables to discuss topics ranging from predatory imaging to quantifying radiology's value. The intent is to set aside typical barriers to communication and allow people to speak their minds in an open setting. The roundtables draw panel members with various types of expertise, including perspectives from large research hospitals, private practices, teleradiology providers, and legal and regulatory affairs. The roundtable format allows the free flow of opinions; each participant agrees to set aside personal agendas and keep an open mind. This year's session covered several subtopics related to the staffing needs of different-sized organizations. Rose even brought a map with Legos so panelists could demonstrate their ideas for contrasting staffing models. The topic at hand concerned how many radiologists need to be onsite vs how much teleradiology capability is optimal. Although the need for onsite coverage will vary by facility, all of the panelists agreed that such considerations are complicated by recent efforts that encourage radiologists to take a larger role in communicating with referrers and, sometimes, patients. "Teleradiology support is fine, but you have to have a 'guy,'" says Daniel A. Dessner, MD, immediate past president of Toledo Radiological Associates. According to Dessner, while there is value in having a "workhorse" radiologist who reads lots of studies all day, every day, there is also value in having a radiologist who can be the face of radiology in a facility; as interest in providing more value to referrers and enhancing patient satisfaction rises, the need for radiologists who are more visible within an organization will increase. Ultimately, the balance of teleradiology to radiologists onsite needs to be customized to the facility, he adds. This balance is made more complicated by the fact that the overall number of radiologists is shrinking, while the volume of images is growing. Combined with the fact that more radiologists are looking for work/life balance, these numbers become more daunting. Some panelists suggested that more flexible and efficient scheduling may help. "We removed all references to 'time on site' from our contracts," says Kirk Hintz, CEO of Radiology Alliance, PC, in Nashville. Radiology Alliance uses radiology coordinators and a centralized system to streamline radiology scheduling. Dropping services that can be provided by other personnel also helps. Hintz says it's important to analyze image volumes to maintain proper coverage. He believes that radiology groups will have no choice but to make larger investments in analytics to fully understand their volume data. 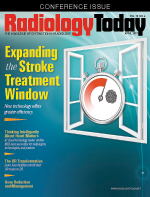 One suggestion for more efficient utilization of radiology services was to employ a distributed model that relies heavily on teleradiology and a small referrer/patient-facing radiology group. It was suggested that IR would be a logical choice for this role because it involves treating patients directly. In this model, the IR department manages the relationships within the hospital, and a chief is designated to manage teleradiology. With utilization of IR procedures growing, this could be a useful model for facilities that perform them. The key, the participants agreed, is to demonstrate the value of the procedures to the organization's decision makers. The participants also agreed that a distributed model may not work in all markets, and there is an open question of where mammography fits in this model. One thing all of the panelists agreed on was that radiology's scope of practice needs to be clearly defined, and questions about culture and billing need to be settled up front. Although there was no consensus on the best way to staff a practice, the participants felt that their time was well used. Rose suggests that RSNA may find more sessions with this format useful for discussing hot-button issues. "Radiologists employ many forms of communication to understand a topic, identify a solution, convince others of their point of view, and assemble a process to achieve a goal. In many forms of discussion construct, there can be factors that interfere with each stage in the process such as departmental politics, power issues, uninformed participants, hidden agendas, and emotional responses," Rose says. "We have found that this interactive discussion model works well. Perhaps RSNA should have more of these on various hot topics."